Luise (not her real name) visited our wound clinic with a very painful ulcer, 6 months old, which had been treated with different dressings without improvement. She presented with hypertension, in treatment for years, but poorly controlled, and type II diabetes. 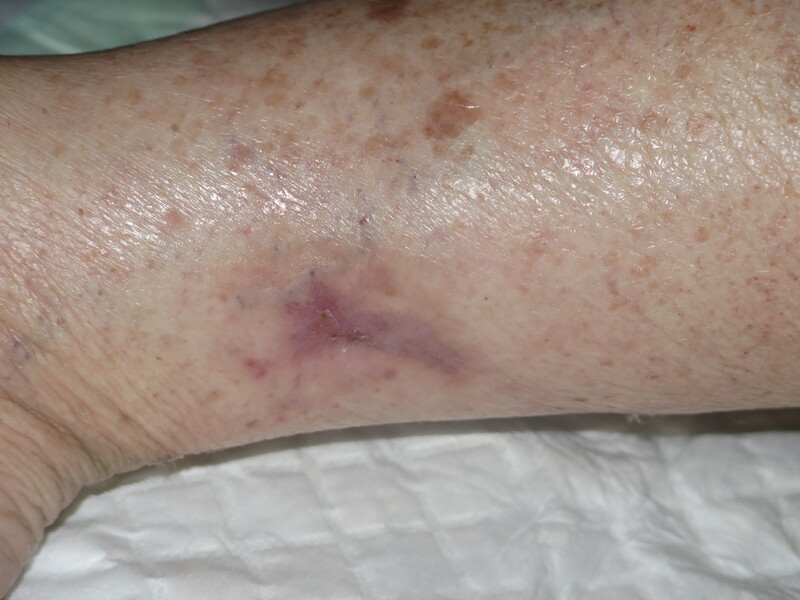 She told us that, after a trauma, a purplish lesion appeared which progressed rapidly towards a deep ulcer. Pain did not increase with exercise or elevation of the leg. On physical examination, the location of the lesion on the inner side of the distal third of the leg was striking, with well-defined, undermined purplish edges and a necrotic wound bed. Distal pulses are preserved. Blood test results showed no alteration of interest. Renal function was strictly normal. We performed a deep incisional biopsy of the edge of the ulcer. 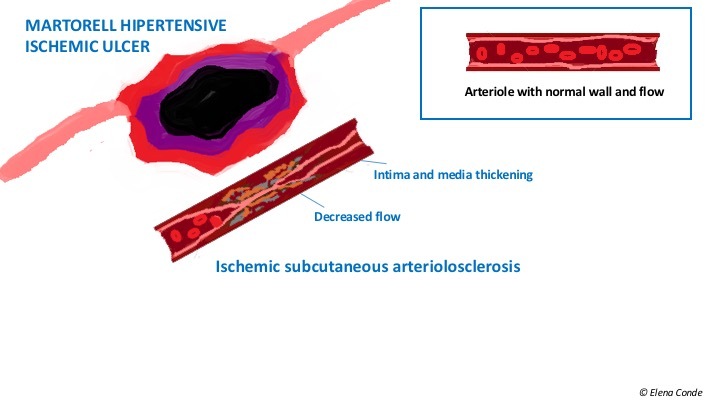 The histological findings corresponded to ischemic subcutaneous atherosclerosis. Considering these compatible clinical and histological pictures, the patient was diagnosed with Martorell ulcer. The antihypertensive treatment was modified, so an adequate blood pressure control was obtained. We performed dressing changes every 72 hours: we cleansed the wound with polyhexanide solution, we placed a matrix of collagen and cellulose modulating proteases dressing and covered it with silicone sheet and gauze. A multiband compression bandage was applied to achieve therapeutic compression (If no contraindication exists, any leg wound may benefit from compression therapy to reduce local inflammation). At 8 weeks, complete epithelialization of the lesion was achieved. Another treatment option would have been to apply topical corticoid and perform early punch grafting (See post: “The interest of topical corticosteroid in Martorell ulcer” and “Interest of early punch grafting in Martorell ulcer“). Why is it called Martorell ulcer? It receives this name because it was the Spanish cardiovascular surgeon Fernando Martorell, first president of the Spanish Society of Angiology (and brother of the also angiologist Alberto Martorell, mythical gatekeeper of Espanyol) who described the first cases in 1945. He stressed that these were patients with a history of uncontrolled high blood pressure and the ulcers were not associated with chronic venous insufficiency or peripheral arterial disease. A year later, Hines and Farber, of the Mayo Clinic, associated the existence of these ulcers with the presence of hypertrophic and stenotic subcutaneous arterioles, and coined the term hypertensive-ischemic ulcer. In the Anglo-Saxon literature the term hypertensive ischemic ulcer of Martorell is used, which is more descriptive than the isolated eponym. Why, if high blood pressure is so frequent, are these ulcers not so prevalent? There are different theories to explain the occurrence of these lesions. However, consensus exists to suggest that arterial hypertension is not a sufficient condition, so it must be associated with other alterations. A high percentage of patients also have diabetes mellitus. High vascular resistance has been found in these patients. This resistance would avoid the distal compensatory relaxation that normally occurs in cases of vascular obstruction, with the consequent decrease in distal perfusion and the appearance of wounds. An alteration of the sympathetic innervation has also been suggested. On the other hand, it is common for a Martorell ulcer to be triggered after trauma. 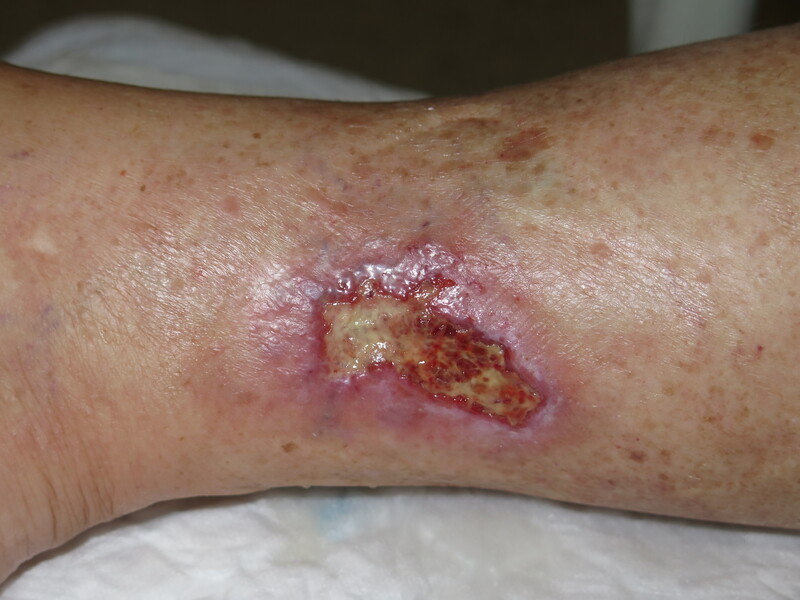 Why is the incidence of Martorell ulcer increasing? 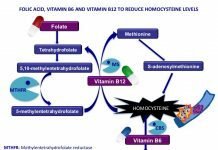 On the one hand, it is due to a greater recognition of this entity and, on the other hand, to the increase in life expectancy of hypertensive patients undergoing treatment. Major cardiovascular events decrease, but the presence of hypertension, although well-controlled, represents a minor complication in these patients. Why does it characteristically appear on the lateral aspect of the leg? It most frequently appears on the lateral side of the leg, but it may also occur at the Achilles tendon level and in other areas of the medial and distal third of the leg. Up to 50% of cases are bilateral and symmetrical. It has been suggested that this is due to the anatomical characteristics of the arteries and the distribution of the subcutaneous arterioles in that area of the leg. However, studies are needed to define the real role of these factors. Typical clinical presentation and the history of arterial hypertension of long evolution make us suspect the diagnosis of Martorell ulcer. 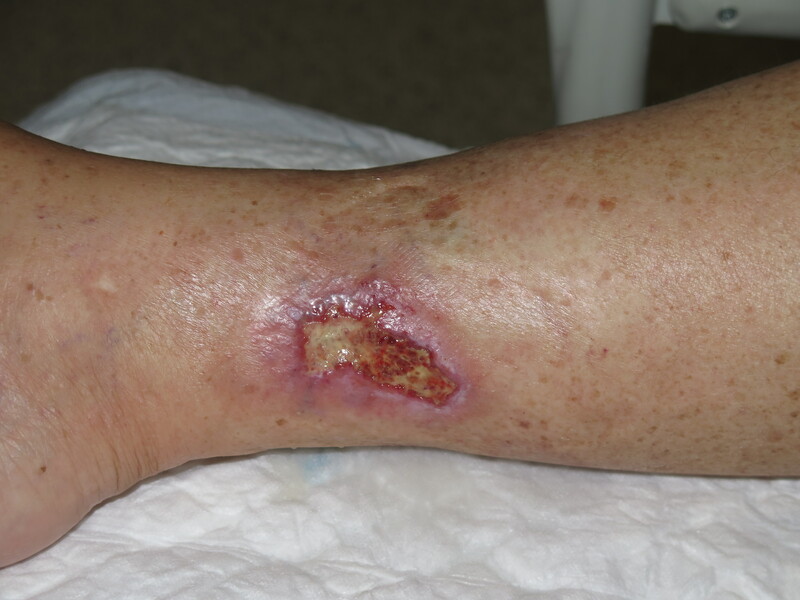 However, there are other pathologies that can also present with painful leg ulcers with a necrosis, well-defined erythemato-violaceous borders and rapid growth. This is the case of other occlusive vasculopathies, calcifilaxis, vasculitis or pyoderma gangrenosum. Some of these diseases present typically with other associated alterations, such as renal failure in calcifilaxis or the presence of auto-antibodies in some vasculopathies. However, differential diagnosis is not so simple in the case of pyoderma gangrenosum, as it does not present pathognomonic data and often represents a diagnosis of exclusion. Histological findings help to establish an accurate diagnosis. Martorell ulcer is characterised by occlusive subcutaneous atherosclerosis, with thickening of the wall and reduction in vessel calibre, in the absence of signs of vasculitis. If the biopsy is not sufficiently deep and extensive, only cutaneous necrosis and an inflammatory infiltrate can be observed and may be confused with pyoderma gangrenosum. Since treatment of pyoderma gangrenosum is completely different from that of Martorell ulcer, it is essential to differentiate them. 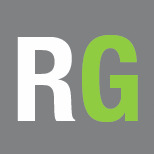 Pyoderma gangrenosum improves with immunosuppressive treatment and worsens with sharp debridement. How should these ulcers be treated? Is it enough to achieve adequate blood pressure control? Control of blood pressure and diabetes, if present, is essential. It should be noted that these lesions appear in patients with good and poorly controlled hypertension. There are cases in which the adequate treatment improves wound healing, but there are others in which, in spite of having a good control, a good clinical evolution is not achieved. As they are very painful ulcers, analgesic treatment is an essential pillar. In dressing changes, cleansing must be carried out, with sharp debridement to eliminate the necrotic tissue and avoid the risk of infection. Since these ulcers are often resistant to conventional treatment, the application of negative pressure therapy or the use of skin grafts may be necessary to achieve healing. If no contraindications exist, as in all leg wounds, compression bandage (adapted to the patient’s tolerance) reduces inflammation and facilitates healing of the lesions. Alavi A, Mayer D, Hafner J, Sibbald RG. Martorell hypertensive ischemic leg ulcer: an underdiagnosed Entity©. Adv Skin Wound Care. 2012;25(12):563-72. Hafner J, Nobbe S, Partsch H, Läuchli S, Mayer D, Amann-Vesti B, Speich R, Schmid C, Burg G, French LE. Martorell hypertensive ischemic leg ulcer: a model of ischemic subcutaneous arteriolosclerosis. 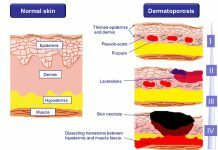 Arch Dermatol. 2010;146(9):961-8. Vuerstaek JD, Reeder SW, Henquet CJ, Neumann HA. Arteriolosclerotic ulcer of Martorell. J Eur Acad Dermatol Venereol. 2010;24(8):867-74.